Why don’t all insurance policies cover pharmacy flu vaccinations? Anti-vaccine paranoia riles me, and I have ruined many a dinner party when seated next to parents who smugly blather on about how they have liberated their kids from the tyranny of shots and spout tinfoil-hat theories about autism, overwhelmed immune systems, and the dangers of associating with recently vaccinated children. Vaccines have done more to improve human health than any single intervention other than clean water. Yes, they carry small risks, but they spare us from crippled limbs; disfigured faces; blindness; hearing loss; cancer; liver failure; sterility; and, most importantly, dying young. A recently published meta-analysis of 16 studies found that flu vaccination reduces the risk of having a heart attack as effectively as quitting smoking or taking cholesterol-lowering statins. It is my regular pharmacy, so it has my insurance information on file. Like 105 million other Americans—almost a third of the U.S. population—I’m covered by Blue Cross and Blue Shield, an insurance company that, it boasts, has been “trusted for 80 years.” The pharmacist came back and told me that my plan “excluded” coverage of flu vaccines. I had asked for a state-of-the-art version of the vaccine—one that protects againstfour strains of the virus rather than three—and was pleased to learn my Rite Aid had it in stock. The vaccine costs about $40, and I could have afforded it, but I was flabbergasted—and even suspicious that the pharmacist had made a mistake. I asked about the old-fashioned three-strain, or trivalent, vaccine. Excluded too. I had entered the Insurance Illogic Zone, another dimension as vast as space and as timeless as infinity. Only about 40 percent of adults receive the flu vaccine each year. (The vaccine reaches about 60 percent of American children, who visit doctors far more frequently than adults.) Vaccines protect not just the individuals who get them: If enough people are vaccinated, they create “herd immunity” and protect the unvaccinated masses by decreasing the circulation of the virus. Estimates of what it requires to create herd immunity for the flu vary based on effectiveness of the vaccine and virulence of the given virus; the U.S. government has set the target coverage for adults at 70 percent. Any way about it, Americans are wide of the mark. In a push to increase adult vaccination rates, the U.S. National Vaccine Advisory Committee in 2011 explicitly recommended increasing the use of pharmacists as vaccine providers. Many adults, the committee recognized, “do not have a single medical home,” meaning a clinic or doctor’s office where they routinely go for care. Pharmacies are an ideal place to offer adults vaccines. Few businesses are more convenient: Rite Aid, Walgreens, and CVS have a total of more than 20,000 locations—that’s about the same as all the McDonald’s and Starbucks in the country put together—they’re open long hours, and they sell many goodies to lure customers who aren’t simply concerned about their health. Big-box stores like Walmart, Target, and Costco have pharmacies, too. It’s something of a duh, but cost-effectiveness studieshave shown that it’s also far cheaper to administer vaccines through pharmacies than medical offices. I contacted several media representatives for Blue Cross and Blue Shield to help clarify this baffling situation. I say several because, in the Insurance Illogic Zone, the venerable Blue Cross and Blue Shield company is not, in layperson’s terms, a company. It is a “system,” and each member company negotiates its own deals. A genuinely helpful media representative for the Blue Cross and Blue Shield company that holds my policy, CareFirst, explained that some affiliates cut deals with pharmacies to provide full coverage for flu vaccination, while others, like mine, insist that you visit an “in-network” provider. For example, he told me that if I lived in the Washington, D.C., area, I could walk into many drug stores and receive the vaccine for free. But he explained that there were different policies in different locations, and on top of that, companies that hire CareFirst to cover their employees sometimes decide which benefits to offer. I had entered the Insurance Illogic Zone, another dimension as vast as space and as timeless as infinity. It’s difficult to gauge how many insured people are not covered for pharmacy vaccinations. “It is an issue,” say Mitchel Rothholz, chief strategy officer for the American Pharmacists Association. “I don’t have a number because there are so many different plans.” I tried to flesh out the answer with both my insurer and several major pharmacies, but I didn’t get anywhere. A Walgreens rep did offer that “more than 90 percent of patients who receive their flu shots at Walgreens have them covered under some form of insurance.” But as I pointed out to him, this doesn’t address the question: 90 percent of people who smoke don’t get lung cancer—but 90 percent of people who get lung cancer smoke. It could be that 90 percent of people who skip the flu vaccine aren’t covered at drugstores. Rothholz has discussed compensation for pharmacy vaccinations with many insurers, and he says an essential problem is the widespread belief that restricting access to health care controls costs. “Plans are going to go with what’s minimally required,” he says. Orenstein, who applauds the requirement, says the “in-network” clause particularly concerns him with flu vaccines because they must be given annually. “To have to do a doctor’s appointment for the vaccine every year is extremely unrealistic,” he says. My bottom line is similar to Orenstein’s: Money isn’t everything, but it’s something. Effective March 2015, all CareFirst members with prescription drug coverage who are outside the company’s mid-Atlantic service area may obtain a flu vaccine free of charge from any CVS Caremark-contracted pharmacy participating in its national vaccine network. This includes over 58,000 CVS, Rite Aid, Target, and Walmart pharmacies across the country. It also offered a Web address that I could go to and search the national vaccine network for members. Voila, my Rite Aid was listed. I emailed him and asked whether this was a typo: Should it read March 2016? 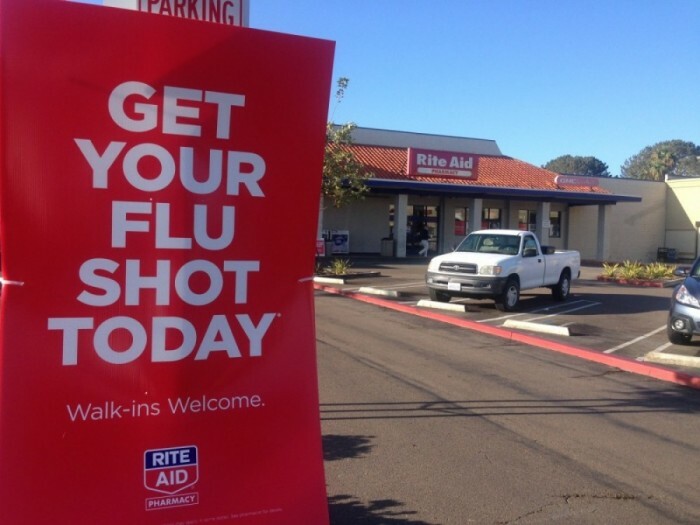 If it did, I was being told that the vaccine would be freely available at my Rite Aid just in time for the end of this year’s flu season, which seemed perfectly illogical and therefore likely. The next morning, he wrote back that 2015 was not a typo. “Stay tuned,” he said. I went back to my Rite Aid. I arrived at around 1:30 p.m. I had my 85-year-old mother, who also wanted to get vaccinated, in tow. She has Medicare. My mother and I turned in our forms. I requested that she receive the high-dose quadravalent vaccine. After a certain age, your immune system starts losing its hearing and needs a louder signal: The high-dose vaccine contains four times the amount of the influenza surface proteins that trigger immunity. We waited. Twenty minutes later, a pharmacist called me over. My mother’s vaccine sat in an oblong plastic basket, the kind that restaurants use to serve fish and chips. My basket was empty. “You’ve been declined,” she said. So much for the IT disconnect and getting to the bottom of the caper. The pharmacist phoned CVS/Caremark’s help desk and began slogging through the robo phone tree. As we waited, another pharmacist explained that they had the high dose for my mother but only in the trivalent vaccine. Roughly 90 percent of influenza deaths occur in people 65 years or older, and the high-dose vaccine is 25 percent better at preventing disease in the elderly. But the trivalent vaccine of course is missing one of the flu strains in circulation. Logically, geriatrics would benefit the most by having the broadest protection and the highest dose, yet no company sells a high-dose quad. You do the math. We looked into this issue and discovered that there was an administrative oversight, whereby the flu vaccination coverage program was not appropriately set up in the system for CareFirst. Thanks to your query, we are in the process of remedying it to provide CareFirst members with coverage for the flu vaccine this flu season. We anticipate the issue should be resolved shortly. I was delighted to learn that I have been of help to my fellow CareFirst members. But I was left scratching my head. Why does CVS/Caremark have to put anything in the system for CareFirst if, as I have already learned on my journey through the stations of the Cross, my benefit is through CVS/Caremark and not CareFirst? I will continue my battle to have a pharmacist at my local Rite Aid shoot me with the quadravalent flu vaccine without any copayment or other cost-sharing requirement, but really, who has the time and stomach for this? And if I haven’t won come mid-October and the onset of flu season here, I’ll buckle down and pay or visit an in-network provider. To borrow from Nirvana, this is stupid and contagious. I mean, consider how many pharmacy customers request the flu vaccine, get excluded or declined by their insurers, and walk out mumbling to themselves: Oh well, whatever, never mind.